With only a few days to go before race weekend, this is instalment 5 of our newsletter. I think you’ve all come to realise by now that I can waffle on for England, and this could be a long one, so please grab a strong coffee (Or whiskey, depending on how you feel) and get comfortable. When you come to register with us on Saturday, you will get a timing chip and strap. This should be fitted to your left ankle, and should go either below or underneath your Wetsuit should we be racing in them on Sunday. The reason you cannot wear your chip over your wetsuit is that when you remove the Wetsuit for the bike, there’s a good chance you will pull the chip strap off with it, and we then won’t get a time for you post swim. What this means, and I just wanted to give everyone advance notice, is that we’re going to be touch and go as to whether we’re going to be Wetsuit Optional or a non Wetsuit race on Sunday. I will monitor the lake temperature closely this week, and keep updates on our facebook and twitter pages, but we cannot make a decision on Wetsuits until Saturday afternoon. As I’ve said in my previous mail, we have some movement in this, and A) we can find somewhere a little cooler in the lake to make the ‘Official measurement’, and B) We have some room for adjustment for Air temperature. However, if it’s drastically over 24deg, it’s simply not safe to bend the rules and send Swimmers out in Wetsuits as you’ll simply cook yourselves. I genuinely try and be as flexible as I can to help people out, but when it comes to safety, we absolutely have to be strict. We don’t have a swim cut off at all, so if you wanted to swim breaststroke with your head out the water for the whole 1900m, you can. I’d strongly suggest that if you get a chance this week, that you please go an have a trial swim in a lake without a wetsuit. If you’re local to the Cotswolds, you can swim in the lake we use for racing Tuesday and Thursday evenings after 5, and Saturday morning before 10am. You might find it’s actually quite a nice experience, but please give it a test before the weekend. As I said above, I will keep the facebook and twitter pages updated with Water Temperatures from Thursday onwards, and we will make our final decision on Saturday afternoon with the water crew and the BTF referee as a group and let everyone know. 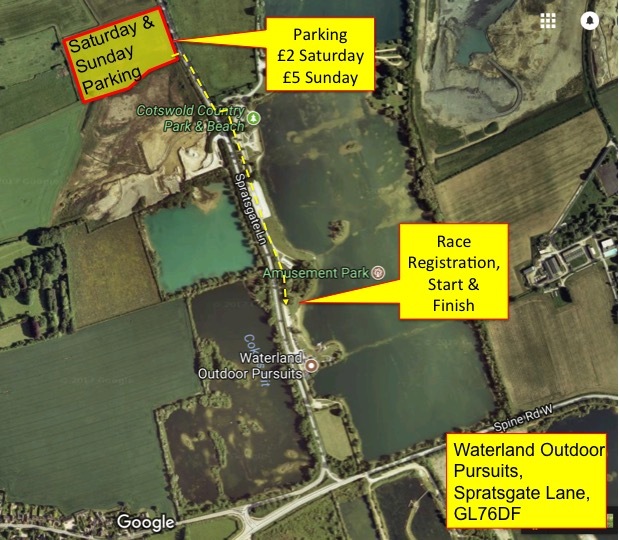 Parking for both registration and Race morning is located in a field a few hundred meters from the lake. Parking on Saturday is £2 cash and Parking on Sunday is £5 Cash payable on the gate. Please can I ask that you allow plenty of time to get parked on race day morning, as although it will seem like a simple process on Saturday when no-one’s rushing and you have everyone coming over a 5hr period, on Sunday morning when it’s Dark and you have 1000 competitors turning up over a 60minute period, there will inevitably be a reasonable sized queue of nervous triathletes sat in cars to get in watching the clock and worrying that they’ll miss their starts. Racing in the heat and how best to make a strategy for our race. Everyone knows that racing in the heat is not easy, but I just wanted to give you all some tips and advice on how it can work for our race on Sunday for each discipline. 2) Bike – We have one Aid station per lap on the bike (it’s a 2 lap bike course). Due to various reasons, the only place we can position this Aid station is fairly well into the lap (around mile 23), so you will have a good period of time on the bike (around an hour for even the fastest racers) before you can get a drink, so please load your bikes up with drinks before you start. Our bike course Aid station has 750ml bike bottles of both Water and pre-mixed High5 (along with Iso Gels and Half cut bananas), and there’s a bottle drop point just before the Aid station. If your bottle is special to you and want it back after the race, we will pile them up close to the HQ tent, and you’re welcome to fight your way through the wasps to retrieve it as they’ll be a rather sugary mess, and a magnet to wasps. 3) Run – As it’s looking to be rather a hot day on Sunday (hopefully I’ve not just jinxed it), we’ll add another water station into the run course at around 0.75 miles into the lap. We purposely buy very large waxed paper cups, as although we only half fill them, it means you can squeeze the top and run with it in your hand without spilling too much. We did talk to the waterpark about using sponges, but they won’t allow them due to the amount of waste and litter they create. The Third aid station is just before you cross the finish line, or start lap 2 and 3, and this has cupped water and ISO gels. We’re not, unfortunately, allowed to provide or apply sunscreen, which is a strange rule, but to do with the insurance saying that if we apply it and you still get burnt, we then become liable for it. With that in mind, please make sure that you bring some and slap it on as much as you can. Right, that’s it from me for today’s newsletter.